My jaw dropped when I discovered this brilliant red bloom on a tree in Lamphun, Thailand. It was the most astonishingly weird flower I’ve ever seen. “Alien” flashed through my mind. The pistil and anthers protruding from the lacy white center petals looked like eyes. I almost expected them to raise their spotted red and green heads to scan me with some otherworldly laser ray. I snapped a few photos, thinking I’d figure out what it was later. Identifying it turned out to be a monumental undertaking. I searched scored of websites that listed the flowers of Thailand and waded through thousands of photos on Google, but nothing came close to matching my photo. Frustrated, I tried a different approach, searching instead for climbing vines. Voila! I found a similar-looking flower, and a bit more research provided my answer. This bright red beauty is a Scarlet Passion Flower (scientific name Passiflora coccinea) native to the Amazon region in South America. It produces the small round passion fruit that is prized for its juice. What it was doing in Thailand, I have no idea. I thought so. I use to grow them here in NC. The flower only blooms for a day. Beautiful! Wow! I must have been very lucky to see them the day I visited. There were literally a half-dozen of them on the vine! Glad you thought so too! This vine can be found all through tropical Asia. I have one growing on my fence in the Philippines and it flowers throughout the year. 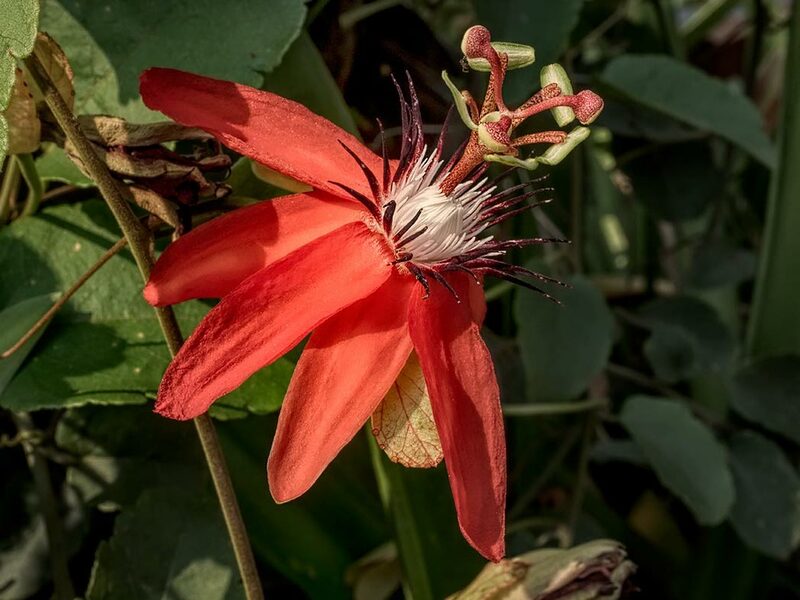 However, it’s not the one that produces the passionfruit with the sweet and aromatic flavour that is sold in fruit shops and markets – that’s Passiflora edulis, a similar looking vine with a white and purple flower. Passiflora coccinea does not produce as much fruit as Passiflora edulis (in fact my Scarlet Passion Flower has never produced a single fruit), and the fruit is quite acidic compared to Passiflora edulis. Passiflora coccinea is primarily grown for its bright red flowers, rather than its fruit. The reason you’ve probably not seen it much is that it tends to be grown by only by those with a green thumb because it’s a bit temperamental for the average gardener. If it gets too wet it drops all its leaves and looks very scrawny, and if it gets too dry it does the same. But give it the right ‘jungle’ environment with rich soil, high humidity and plenty of light, it will go mad and take over everything. Hi David: Thanks so much for the additional information. I believe another reader said the flower lasts for only a single day. If that’s accurate, I feel doubly lucky to have seen it! Thanks. The standard color is purple, wonder what other varieties there are? Some places use passionflower tincture to improve mood. Hi Satin: My research turned up many varieties in lots of different colors.